The Unger Rx restroom cleaning system is the first cleaning system designed by custodians to help them work faster, safer, and better than ever before. The system is comprised of three parts: an innovative restroom cart, advanced floor care tools, and best in class cleaning accessories. Once your cart has been fully assembled, stock the cart with all paper, soap, and any other refill items. The optional hanging storage module will keep these items clean, dry, and within reach. The Restroom Rx cart has specific clips, hooks, and holders to hold each tool of the cleaning system. Though some placement of where you put these tools on the cart are personal preference, when the cart is all set and ready to go, it should look something like this (0:54). The Restroom Rx system comes with two different swiveling brush tools, designed for deep cleaning on grouted surfaces. 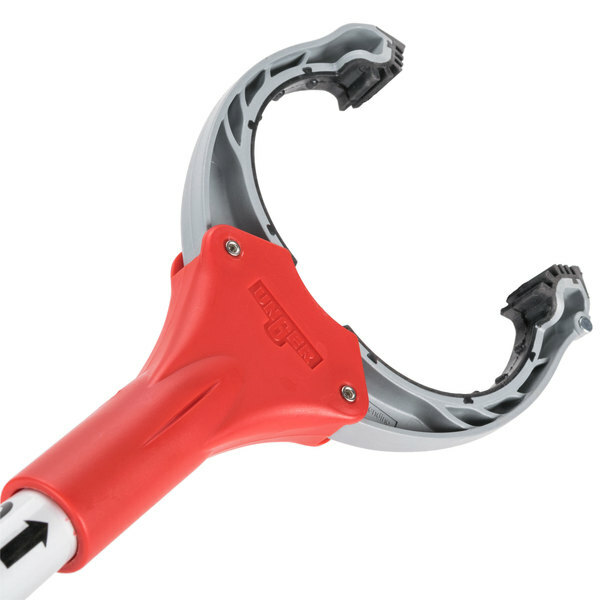 Each tool connects to the adjustable Ergo handle by pushing in the tab and locking it into place. The Pro Duster with sleeve is used for dusting higher areas of the restroom, including the tops of partitions and mirrors where hidden dust collects. The Ergo telescopic broom and dustpan are used to easily remove loose debris from floors before any scrubbing or mopping. 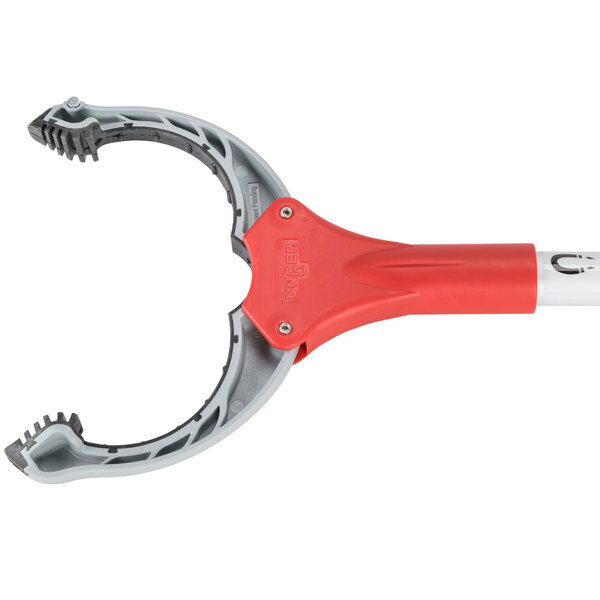 The 18" Nifty Nabber is a tool used to grab items in tough to reach places, or items caught in toilets or urinals. The Ergo toilet bowl brush is used to get into hard to reach areas of the toilet bowls and urinals. The brush can be stowed away in its drip-free holder and hung back up on the cart. The Restroom Rx system comes with a 32 qt. split bucket and collapsible flat mop tool, which also connects to the ErgoTec handle. When locked, step on the release tab on the top of the mop frame. The frame unlocks and folds, allowing the mop to be dipped into the side press. The front chamber of the dual bucket is filled with the cleaning solution. The rear compartment below the wringer contains rinse water to clean off the mop. When it's time to wring out the mop and get new solution, the mop is inserted through the press into the rinse water, and dipped before it is wrung out. Then it's back to the cleaning solution; a light squeeze with the press, and you are ready to mop again. To begin mopping, simply drop the mop to the floor. The mop head will automatically lock into place. A quick-release drain on the back side of the rinsing compartment is used to dump dirty rinse water without dumping out the cleaning solution. When it's time to refill the bucket, the easy adapter hose can attach to most sinks for a simple and quick refill. The following instructions will take you step by step on how to properly clean a restroom using the Restroom Rx cleaning system and tools. Before getting started, always make it a habit to use personal protective equipment, such as gloves and goggles before you begin. Step 1: Remove debris—Using the Unger Nifty Nabber grabber, clean and remove any and all debris from toilets, urinals, and hard to reach areas in the restroom. Check all urinals and toilets to make sure they have been flushed. Step 2: Dispense cleaning solution—Spray cleaning solution inside and around all urinals, toilets, and sinks. Be sure to let the solution dwell for the proper time as recommended by the manufacturer before rinsing or wiping them down. Step 3: Replenish supplies—Replace all toilet seat covers, hand towels, and toilet tissue. Refill all soap dispensers and empty the trash cans. Step 4: Dust and spot clean—Using the Unger Pro Duster, dust off and spot clean hard to reach spots and high areas in the restroom, such as the tops of partitions. Remember to clean surfaces starting at the top and work your way down. Step 5: Sweep floor—Before mopping, clean all loose dirt, sand, and debris from the floors with the Ergo dustpan and broom. Remember to get all corners and hard to reach spots. Step 6: Clean Surfaces—For best results, spray a microfiber cloth with your cleaning solution of choice. Clean mirrors, fixtures, and door knobs. Wipe down surfaces previously sprayed down with cleaning solution, such as countertops and sinks. Step 7: Clean urinals and toilets—Clean inside urinals and toilets with the Unger Ergo toilet brush. Wipe down all surfaces that are still wet with disinfectant using a microfiber cloth. Step 8: Mop floor—Collapse the flat mop by stepping on the foot pedal located on the top of the mop frame. Dip through the back section of the bucket through the wringer into the rinse water. Then wring out the mop. Dip the mop into the cleaning solution and wring out the mop again. Simply drop the mop onto the floor to continue. Begin mopping in an S pattern starting from the back walls and edges of the restroom. After edges are mopped, continue mopping in an S pattern walking backward toward the door until completed. The Unger Rx restroom cleaning system was created to standardize the sanitation process for consistent results and increased efficiency. Thanks to Unger's smart, ergonomic tools, restroom cleaning has never been easier! Start with the Sprayer On A Belt tool to apply cleaning solution to the insides of toilet bowls and urinals. While the solution dwells, clean other surfaces with a microfiber cloth. Always spray solution directly onto the cloth and then wipe. After the cleaning solution has had time to set in, clean urinals and toilet bowls using the Ergo toilet brush. Now flush all toilets and urinals. Fill the Dual Bucket with water in the back compartment and cleaning solution in the front compartment. Next, dip the mop into cleaning solution, wring it out, and start cleaning. Begin by using the microfiber mop around the perimeter of the restroom. Use an "S" motion when mopping and walk backward toward the door. Note: The Dual Bucket also works with string mops. When finished, open the rear spout to empty the bucket into a drain or lift the bucket and dump the remaining water manually. Watch this step by step video to learn how you can use Unger's specialized restroom cleaning tools to thoroughly and efficiently clean your restrooms. 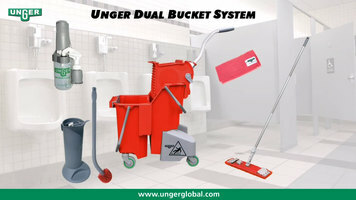 Unger's Dual Bucket system is red to signify that it is designed for restroom use only. 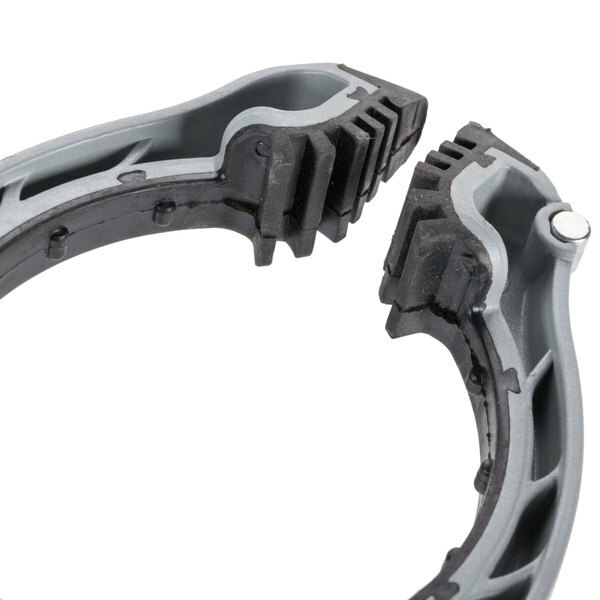 Additionally, it features an easy-to-read fill guide and an ergonomic design that requires no bending down! It can be emptied into a drain using the recessed locking drain spout, or you can pour out the remaining water manually through the rear-mounted dump spout. The Ergo toilet brush & swab includes a base that catches excess water for a drip-free design. It also features an ergonomic design with no bending required, and its swab attachment cleans even the most hard-to-reach places. 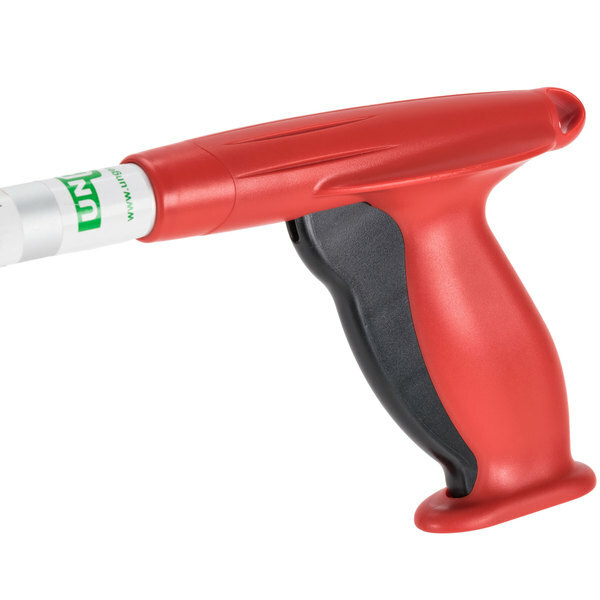 The Unger Sprayer on a Belt tool attaches directly to your belt for convenient access. It has a red strip to indicate restroom use only, and the sprayer is capable of spraying upside down for cleaning every crevice. Other available accessories include the WW180 easy adapter hose, the SMSBG side bucket, an IKITR restroom inspection kit, an IMIRR inspection mirror, the NN40R 18" NiftyNabber, the LWDUR ProDuster, a BSOAB adjustable nylon belt, as well as the SB20G and CB20G SmartColor swivel brushes. This video outlines the features of some of Unger's specialized restroom cleaning products, including the Dual Bucket, the Ergo toilet brush, and Unger's Sprayer on a Belt. 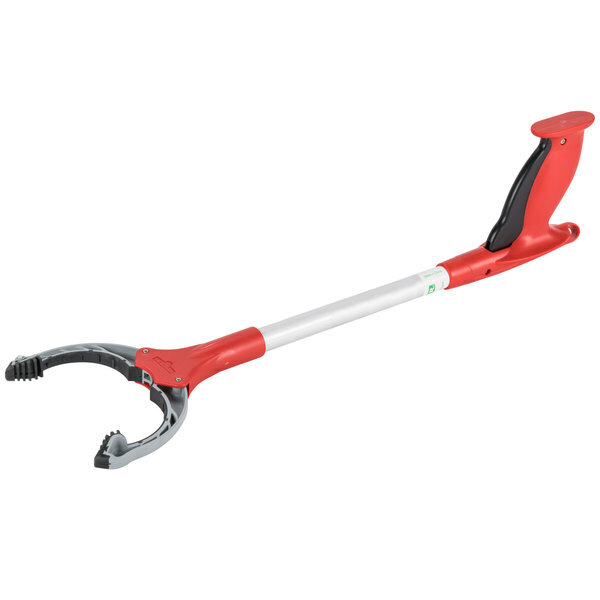 Easily reach, grab and remove unsanitary debris with the Unger NN40R Nifty Nabber 18" red restroom trash grabber! This hygienic all-purpose grabber features rubber-coated steel fingers which offer a firm and precise grip of objects, and its 18" long arm ensures you stay a safe distance from bacteria and trash. 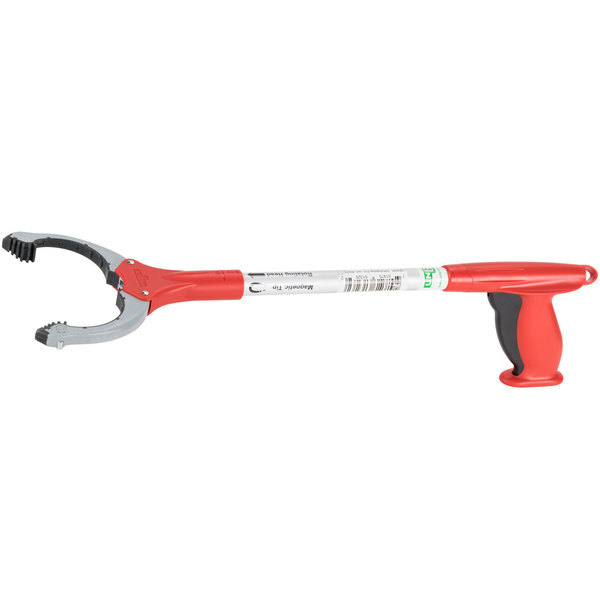 Ideal for janitors and maintenance workers, the unit's ergonomic handle is designed to minimize wrist strain during repeated use. Great for reducing contact with contaminates while cleaning, this item's red color distinguishes it for restroom use as part of Unger's SmartColor system. Unger's SmartColor system suggests that items labeled as red are to be used in restrooms or other high bacteria areas, yellow in specialty areas, blue in general areas with low risk bacteria, and green in foodservice areas. Good for picking up the nasty stuff in the bathroom without bending quite so much to pick it up. The handle is ergonomically well designed. I should've gotten a longer one though.